Congratulations Dr. Loveland & Dr. Osmun! 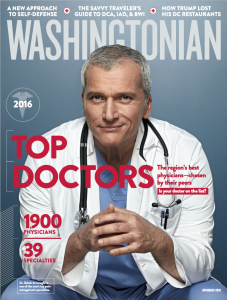 Congratulations to Dr. Joan Loveland and Dr. Scott Osmun for being named two of Washingtonian’s TopDocs for 2016! Pick up the most recent issue at a newsstand near you to learn more about Bloom Ob/Gyn and other preferred physicians in the Washington D.C. metropolitan area. Odds are you never expected to hear the words “nanotechnology” and “menstrual cycle” in the same sentence. If you read the Washington Post and saw this week’s Health Section, then you know where I’m headed. Thanks to Dr. Sharma at the Indian Institute of Technology, maxi pad technology is about to be revolutionized. Indian women have limited access to clean and absorbent pads. Sadly, they may even use rags, sand, or newspaper to absorb their monthly cycle, which is a set up for infection and discomfort. Fortunately, here in the U.S., women have an over abundance of pad options and access to other services like the new Lola tampon subscription delivery service or collection methods like the Diva Cup. 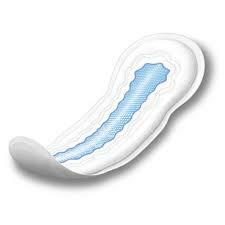 Pads work well here because of super absorbent polymers or SAPs. The untold truth, though, is that SAPs may not be so kind to your labia. They are petroleum based – a chemical that takes eons to degrade in landfills. Not only are they environmentally unfriendly, but they are also not kind to your body. Many women develop allergic reactions to SAPs and they have also been attributed to pelvic infections, like toxic shock syndrome. Tampons do not contain SAPs. On a crusade to develop a better maxi pad for Indian women, Dr. Sharma (a male scientist!) and his team have created a new fiber that is SAP-free and absorbs liquid better. They are more porous with a larger surface area and softer to the touch, which makes for more grateful vaginas. This is great news for Indian women who may soon have access to a safer, cheaper, and improved pad. It’s estimated that Indian women may miss up to two days of work per menstrual cycles, so the economic implications of a superpad are fairly significant as well. Kudos to Dr. Sharma for this advance in women’s health! He and his team are currently working to mass produce the product in the Indian market and hope someday to reach the U.S. market as well. Regardless of your choice of tampon or pad, it’s nice to hear of a man out there wanting to keep us more comfortable and chemical free. My breasts are dense? What does this mean and should I care? Many of my patients have noticed and asked about a recent addition to their mammogram results letter – a comment regarding the density of their breast tissue. It’s a proportional measure of the different types of tissue that make up breasts. Glandular and connective tissue absorb more radiation and show up white, whereas fatty tissue is dark. The ratio of white to dark determines breast density. 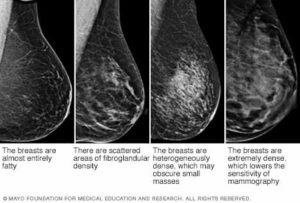 For consistency, a scale of 1-4 was created (the BiRADS scale) to describe the density of breasts on mammo gram reports. A lot of women – about 50% – have dense breast tissue: 40% moderately dense and 10% extremely dense. Increased density obscures mammogram imaging and lowers the accuracy of breast cancer detection. For example, a mammogram will pick up cancer in 85% of all women with disease. This number is as high at 98% in women with predominately fatty tissue, but as low as 65% in women with dense tissue. In other words, a third of cancers cannot be seen in dense breast tissue. Increased breast density is an independent risk factor for developing breast cancer with a 1.9% to 6% increase in risk. These cancers tend to be larger in size, diagnosed at a later stage, have a worse prognosis, and an increased risk of recurrence. Clearly, breast density alone does not determine breast cancer risk. For example, African-American women tend to have a higher percentage of fat in their breasts, but are more likely to have aggressive breast cancer. Asian women tend to have denser breasts, yet have lower risks of developing breast cancer. Thus, ethnicity, family history, age, weight and medical history all play a role in cancer risk. Why is this information showing up now? Only recently have we realized that increased breast density is an actual factor in breast cancer risk and this has resulted in advocacy for patient notification. In 2009, Connecticut was the first state to enact a law requiring Radiologists to inform women of breast density. Since then, twenty-seven states have followed their lead and eight more are in the process of doing the same. So what do I do if I have dense breasts? Unfortunately, the answer is unclear. Breast MRI or ultrasound may help in the detection of cancer in women with dense breasts, however no studies have demonstrated improved outcomes. In addition, both of these imaging techniques are more likely to show abnormal findings that aren’t cancer which increases the rate of unnecessary biopsies. While there are no current guidelines for MRI or ultrasound in the presence of dense tissue, there is growing evidence that three-dimensional (3D) mammography increases visualization of breast cancers and reduces the need for recalls. This technology does increase exposure to radiation, but the actual exposure is quite small. Inherent to this discussion is the value of patient education. Recognizing the limitations of mammography, especially with dense breast tissue, and each patients’ risk profile is paramount to individualized care. Using validated tools and algorithms to calculate breast cancer risk will allow us to make informed screening decisions together and – armed with this information – I believe women can make more thoughtful decisions regarding their own breast cancer screening plan. Call us today at (202) 449-9570 to make an appointment! * For convenient parking options, look here! Study Provides Additional Evidence Of Link Between Zika And Guillain-Barre Syndrome.